The striking hill town of Loreto lies just inland from the Adriatic Sea and is one of the world's most important shrines to the cult of the Virgin Mary. The town mainly exists to service the thousands of pilgrims who travel here from around the world. The great dome of the shrine dominates the countryside for miles around; below it stands the focus of piety - the cottage from Nazareth that witnessed the Annunciation and the childhood of Jesus. Although the Santa Casa arrived, according to tradition, in 1294, it was not until 1507 that the Church finally approved of Loreto as a place of pilgrimage, though work on the church had begun in 1468. It was Pope Julius II who decided to pull out all the stops and give the primitive cottage a fit setting. The result is a showcase of work by many of the most celebrated names of Late Renaissance Italy. The statue within the walls of the Santa Casa of the Black Madonna of Loreto is a modern copy of the original destroyed in a fire in 1921; some claim that the tradition of the Black Madonnas to be found in many famous shrines is a reference to the prophetic line referring to Mary in the Song of Solomon, "I am black, but comely"; others more prosaically point out that the statues were often carved in dark hardwoods, later further blackened by the smoke of votive candles. At the bottom of the right nave are the church's greatest artistic treasurers - gem-stone coloured frescoes in the Sacristy of St Mark by Merlozzo da Forli', and Luca Signorelli's noble frescoes in the nearby Sacristy of St John. 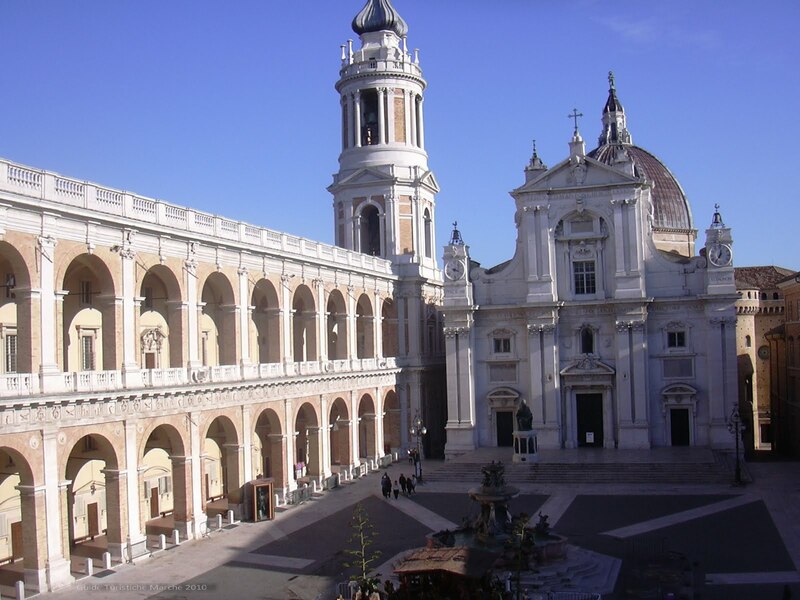 Piazza della Madonna, the elegant set-piece square with a delicate Baroque fountain that fronts the Sanctuary is flanked on two sides by the arcades of the 16thC Palazzo Apostolico. The Museo-Pinacoteca houses a fine group of late works by Lorenzo Lotto (the Venetian master retired and died in the monastery here in 1556) and an unusual collection of Renaissance ceramic pharmacist's jars. The simple cottage at Nazareth where the Annunciation took place and were the Holy Family lived, so the legend goes, was borne away by angels in 1291 as the Saracens descended on the Holy Land. It first arrived on a hill in Dalmatia. Here it stayed until the 10th of December 1294, when it was again miraculously moved, this time across the Adriatic Sea to a laurel grove (Latin lauretum, hence Loreto) infested by bandits. Its final resting place, though, was a few miles away in the middle of a public highway on the top of the hill of Loreto. Experts in our more sceptical age now suggest that the bricks of Mary's house were brought from Palestine in the ships of the retreating Crusaders.